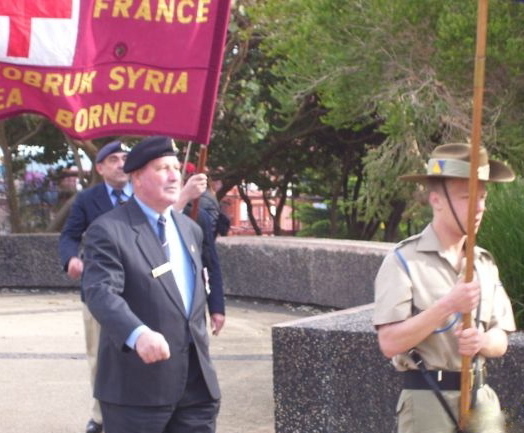 Association Secretary Alan Curry OAM on Reserve Forces Day in Sydney. The Unit was first raised & with the formation of A and B sections at Liverpool (Sydney) camp on the 15th March 1915, under the command of Lt.Col. R.E.Roth, D.S.O. V.D. It seems that the unit formed a CAMP DRESSING STATION, which was disbanded and then became 2 CAMP HOSPITAL (and later, 2 MILITARYHOSPITAL, INGLEBURN). The 2/5th Australian Field Ambulance was formed in Victoria, in May 1940, at PUCKAPUNYAL and was disbanded in BALIKPAPAN (BORNEO) in October 1945. Unit Historian, Sgt Lloyd Tann wrote..."Our ship sailed out of Port Philip bay and joined a large convoy to BOMBAY. We landed on the 4th November and departed, in smaller ships, on the 12th (we celebrated ARMISTICE DAY (11th) in BOMBAY. When PEARLHARBOUR was bombed in December 1941 by the Japanese, events took an ominous turn and we were shipped out of the MIDDLE EAST in a movement code-named STEPSISTER which involved a number of ship movements with troops, stores and equipment. The convoy stopped and refueled in COLOMBO and eventually reached PORT ADELAIDE on the 27th March 1942. Once in Australia, 2/5th went into intensive training for the important move to MILNEBAY. Early in January 1944, we were flown (for the first time) to DUMPU in the RAMUVALLEY. We took over the Medical Dressing Station from the 2/4th Fd.Amb. The 2/5th Field Ambulance was disbanded on the 13 October 1945. We served in EGYPT, SYRIA and NEW GUINEA. Our unit was awarded One DCM, One MBE, One MM and Four MIDs." 5th Field Ambulance was again raised as a C.M.F. unit in 1948, and in 1951, after the first National Service Intake from 19 NS Battalion at HOLSWORTHY (NSW), the unit eventually came back to full strength of over 250 Officers and soldiers. The last parade of 5th Field Ambulance was held on the 9th March 1976 with the C.O. Lt.Col.P.J. (Jim) McGrath (dec.) in command. This was the result of the Australian Government's "Millar Report". The unit was again re-raised on the 6th February 1989 and was based at Carlow Street, CROWS NEST (Sydney) and commanded by Lt.Col. Derek Cannon (now current President of our Association). Due to re-organisation within the army in 1995, the unit became part of 5 BASB (Base Administrative Supply Battalion). 5 Field Ambulance became a Health Company and was called Health Company, 5 BASB, 5 Field Ambulance. Book "One Mans Story"--an Autobiography by Keith Jones.